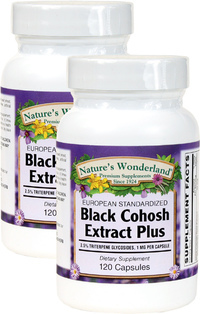 Black Cohosh Plus Standardized Extract - 40 mg, 120 Capsules each (Nature's Wonderland) - Penn Herb Co. Ltd.
Black Cohosh is one of the leading herbs for menopausal and menstrual discomfort. Its powerful plant compounds soothe menstrual cramps, ease hot flashes and the nervous irritability & mild mood changes that accompany menopause. 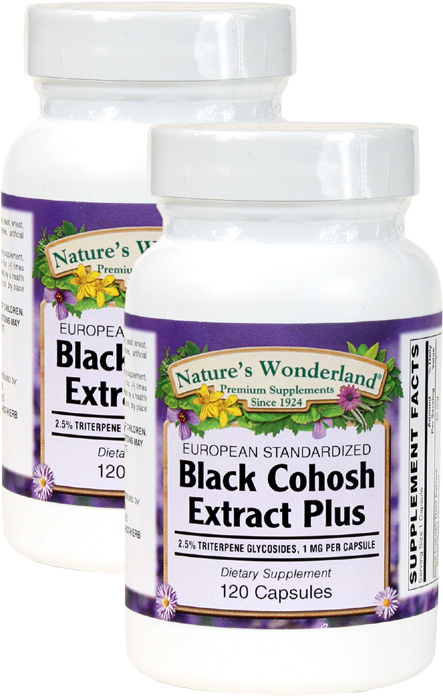 Traditional female vitality tonics, Chasteberry and Dong Quai work synergistically to enhance the proven benefits of Standardized Black Cohosh Root Extract. Supports menopausal health; hormonal balance; PMS; helpful during menstruation; menstrual cramps; supports a healthy female cycle. As a dietary supplement, adults take 1 capsule, four times daily with meals, or as directed by a health care professional.